Archives of Eaton Bray News for September 2016. Eaton Bray Parish Council would like to congratulate Eaton Bray Cricket Club winning the 1st Division and 2nd team getting promotion to Division 5 of Four Counties Cricket League, by flying the Eaton Bray Cricket flag at the three corners for a week as a celebration of their success. For more information, please see Eaton Bray Cricket Club win League Title. The next Parish Council meeting will be held on Monday 3rd October, from 7.30pm, in the Coffee Tavern. 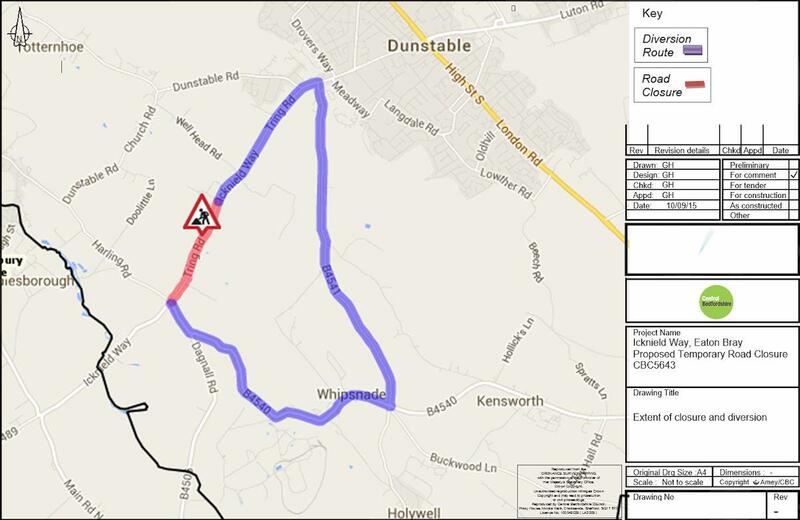 I have a request for a Proposed Temporary Road Closure at the above location to enable Carriageway Lining works to be carried out in safety. Details are listed in the schedule below and having assessed the application I am satisfied the request is justified. The alternative route for this closure is as in the details below and will be signed accordingly. The restrictions are to be in operation only when the necessary signs are erected on site. The Legal Order has been made to cover a twelve month period. Access may be allowed from time to time according to local signing. Date: The closure is expected to take place from 0900-1530 on Tuesday 13th September 2016. Alternative Route: Head north on Icknield Way/B489 towards Icknield Way/B489, exit onto Whipsnade Rd/B4541, exit onto B4540, Turn right onto Dagnall Rd/B4506, turn right to site and vice versa. The applicant will be responsible for taking down all Central Bedfordshire Council public notices immediately after the works requiring the Order have been completed. Eaton Bray CC have won their first League title since 2009, with a weekend washout against title rivals Biddenham CC ensuring them enough points to be crowned champions. 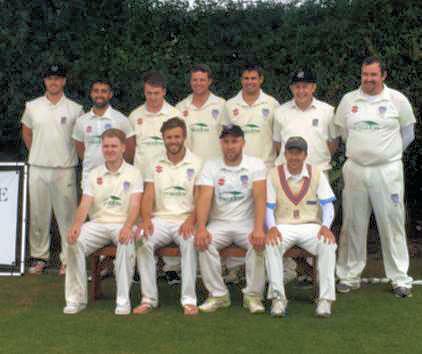 The season was a hugely successful one for the club in general, with the 2nd XI sealing promotion from Division 6 of the Four Counties Cricket League and further growth in the youth section of the club. The 1st XI benefitted from an unbeaten start to the season, going 9 matches until they tasted defeat, and although that culminated with a 7 match winless streak, the brilliant start kept enough points in the bank to seal their crown. Two matches stand out as a stark reminder as to how they achieved their success. New Bradwell away, when a Jaco Jacobs rearguard saw them escape almost certain defeat with a draw and the win away at New City CC early in the season, both during that unbeaten run. 'Jaco is your attacking-type of batsman, and although destructive, will be the first to admit he gives away his wicket away too easily at times'. Not on this occasion however, with the team struggling at 160-9 in pursuit of 254, Jaco batted out 21 overs to see us to 215-9 and safety, gathering 13 points for our efforts, showing the now engrained resolve that made the team togetherness such a poignant factor. Only a few weeks earlier, the team beat New City convincingly for the first time since their opponents had been promoted to the top division, back in 2011. 'We just kept finding ways to lose or badly draw against them in the past, says Peacock, but not this time'. A brilliant 69 from Andy Norris set the tone, and with James Flecknell contributing with 4 wickets and a brilliant close catch, the hoodoo was broken. Ending the season with 5 batsmen in the top 20 in the league, and 3 bowlers within the top 20 also further emphasises the talent the team possesses. 'Again, togetherness is the key says Josh, but some of the individual performances this year have been fantastic in seeing us home. All I've done is placed great importance on team spirit, each Saturday, but this season is down to all of the players that have played for us. We've used 22 players this year, and every single one deserves the accolade of winning the league. The campaign can now serve as a springboard for future success, there's so much potential here for us to be hugely successful for years with a balanced mix of experience and youth. You are viewing the September 2016 archive.